A large scale project briging together Archer's unique mix of rock, improv and contemporary music sounds. This CD continues the music journey I began in 1988 with Wild pathway favourites, and which has produced a release every three or four years subsequently. It follows the format of working with a large group of players who are combined in different ways on each track. Let's begin with the cover. 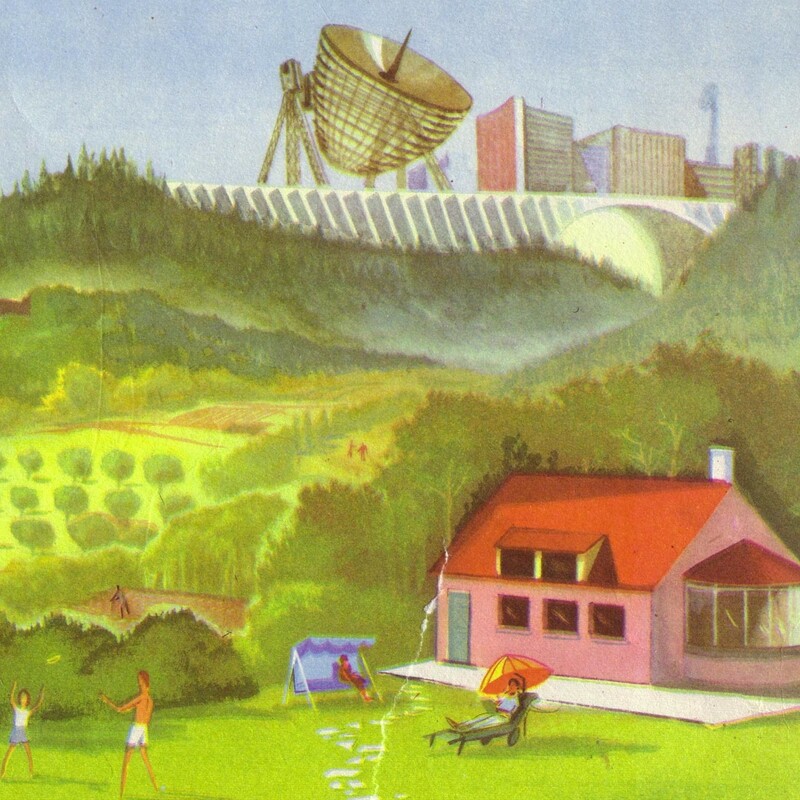 It's from an old encyclopaedia I owned as a child, and disregarding totally it's artless qualities, I was fascinated by this image of a perfect future and would often linger over it. Was this really what it was going to be like in the future? An eternally warm and perfect evening played out in a family home, a world still in touch with nature but secured by technological advances which could only be dreamed of. The music begins with All the wars were lost which is a text fragment from Keith Jafrate's Songs for Euridice. I've been using this piece to begin my solo concerts over the last couple of years, and the basic track (organ solo) is from a live recording. Picofarad is the first of several tracks on the based on Chris Cutler's drum loops. These provided the structure for the piece, which I then populated with a virtual rock band. I recorded Karl's guitar "clean", and added extensive processing and editing later. I'm profoundly excited about all the tracks on this CD which stick to this "primary colours" soundworld, and it would be great to have a real band which could do this stuff. Karl is currently studying music at York University, and he's a fine woodwind player as well as being on exciting guitarist - watch out for him! My favourite piece on this record is Nach Schriesheim, and I came up with this perfect Krautrock bassline whilst driving toward that fair town across the beautiful German countryside. Dig my dubbed out snare drum sound (actually two plastic bottles and a lot of software). It was a great thrill to work with Julie Tippetts once more, and her voice features on each of the long pieces which are at the heart of both CDs in this set. I'm not much of a librettist, but I do get plenty of spam emails which a couple of years ago began to feature loads of randomised text to fool the spam filters. I'm unsure whether it was a real person or a computer which was able to wax so poetic, but I collected a whole load of these and picked out lines for Julie to sing (plus they provided many of the song titles for this set). Severed me is assembled form various solo improvisations by me on violin, harmonium, junk etc, which I orchestrated with multi tracked and solo Julie (recorded at her wonderful cottage in Gloucestershire), finally adding the played live free jazz rhythm section plus my own clarinet solo. Spun sugar is another spam piece. I morphed Chris's drum loop with one of his solo percussion / electrics improvisations to make an extraordinarily detailed basic track. Karl's guitar harmonics and UTT's turntables completed the picture, and Julie made the vocal melody and arrangement. It's a hit! I like to do at least one cover version, and I've always admired Jimmy Giuffre's version of In the mornings out there, a haunting Carla Bley tune. I've started to play baritone sax over the last year or so, and decided to make a more muscular / AACM version of the tune for this record. I tried to evoke the spirit of Hornweb on this, and I knew I'd succeeded when Dave volunteered the opinion that my harmonies were completely lacking any logic. The first disk closes with Army of briars, named after the folk group I play in, but inspired musically by seeing Sunn O)))) on the TV. The basic organ track is another concert recording. The second disk begins with my virtual rock band once more. Few hammer tries to evoke the impetus and density of Miles at his most imploded, and combines several of Chris' loops with a ferocious rhythm part by Karl (heavily reprocessed) with James' rather creepy slide figures. I'm like hello is a solo track which is based on a violin improvisation, which I put together after hearing a short composition by Joanna Bailie which particularly struck me in it's fascinatingly restricted scope, and which I attempted to put my own spin on. If the previous track reflects my interest in the fine detail of nothing much happening, then the maximalist Stockhausen ascent! is pretty much the opposite. This was written and added to this set at the last minute, in the days following the passing of the Master, and is a musical representation of his joyous ascent into Glory. The base texture is an improvisation on a set of Tibetan prayer bowls, ring modulated (naturlich, und sehr Stockhausen) and orchestrated with choral samples, a simple piano figure, and Karl's fearsome guitar solo, which I lifted from another track. Twirly light fuses together 2 organ solos previously released on my old 10 organ studies LP, and adds Julie's beautiful melody and harmonies, recorded in one take. A daredevil in the forest is the second "big" spam libretto piece of the set, and follows the format and procedure of its counterpart on the first disk. I was lucky to be able to play this piece live at the 2007 Huddersfield Contemporary Music Festival, where I had the distinction to be the first and probably last musician to visit the grandeur of the Mellotron upon that august gathering. Dave and Charlie have chance to improvise at length on this one. Dot demi is another virtual rock band track, highlighted by UTT's sunny melody and Terry's crunchily muscular bass. Originally written with Damo Suzuki in mind, maybe next time…..
No Archer release is possible without an overt Mike Ratledge reference, and Birds edge, complete with distortion and long delay, fulfils that role admirably this time round. I sneak in a baritone sax duet at the end. Finally, In stereo gravity, which I've been using to finish my solo shows, is built on a single hypnotic Cutler drum loop, and again visits electric Miles territory. Karl's Stockhausen ascent! guitar solo is heard here in it's original setting, before I bring things full circle with a slight return to All the wars as the piece breaks apart as it's fed through a granular delay. Thanks for taking the time to listen to this long record. I've tried to put forward a set which is packed with detail, which makes some sense of the diversity of it's many parts and which you'll really want to get to know and live with. To cite two of my personal favourite inspirational records by great English masters, if my last CD Heritage & ringtones (2004) was my Liege and Lief, then this is my Physical Graffiti I guess. Chaired by electro-acoustic musician (plus) Martin Archer, the Sheffield based Discus Records is a resolutely independent concern whose selective catalogue is imbued with a pioneering and free thinking set of values. One of the label's most recent releases is Martin's double CD 'In Stereo Gravity' which certainly looks from where I'm standing to be some kind of landmark solo statement, as if everything beforehand was in some way a preparation for this. 'In Stereo Gravity' uses various permutations drawn from a large, five-decade rich pool of players plus scatterings of reprocessed input from the great lost folk voice of Anne Briggs and mod jazz bandleader Art Blakey. Within the depths of 'In Stereo Gravity's sixteen tracks that comprise an album that took three years to complete, we can also find contributions from Chris Cutler (drum loops on the east/west hybrid 'Picofarad'), Charlie Collins and Terry Todd who you may and should recall from eighties Sheffield-garde bands Clock DVA and The Box. There's also an all too rare sighting or four from Julie Tippets (nee Driscoll), her rather unusual remit on 'Severed Me', 'A Daredevil in the Forest' and 'Spun Suger Barbed Wire' being to recite fragments of spam email messages, which is surely one of the first positive uses ever to come from the computer blight I've ever encountered.